Can you remember back to your childhood Sunday School days? Did you ever make crowns of yellow construction paper, symbolizing the crowns we’d someday wear in heaven? In my class, we were encouraged to add colorful cut-out jewels, to represent all the good deeds we would do for Jesus. The idea was he would reward us for our obedience. And didn’t we all want beautiful, sparkling crowns to wear when we got to heaven? You probably remember: the bridegroom is an image used several times in scripture to represent Jesus (Matthew 9:15), and the bride represents God’s people (Revelation 19:6-8). But that still doesn’t explain decisively what the jewels are. …will last forever, won by running the race of the Christian life with perseverance (1 Corinthians 9:24-27). …represent those believers who are in heaven as the result of our efforts. They will be our crown—our glory and joy (1 Thessalonians 2:19). …God has promised—a crown of life to those who love him (James 1:12). 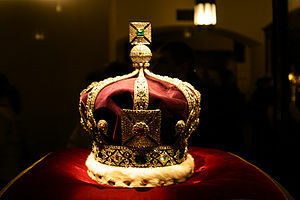 Revelation 2:10 also speaks of this crown. …we’ll receive when Jesus appears—crowns of glory (1 Peter 5:4)! But nothing about jewels in those passages. And to be honest, the crown references are more than likely imagery and metaphors—not actual crowns. As I’ve gotten older, even the teaching that “crowns await us in heaven” has bothered me. Striving for obedience and bringing others toward commitment to Jesus for crowns seems so selfishly motivated, so mercenary. Jesus has already given me eternal life, his loving care, his Word, and countless other blessings. IF we receive crowns, we won’t be wearing them. And we won’t be needing lovely showcases in which to display our crowns either. This totally changes my motivation for earning crowns. They aren’t trophies at all. They may become objects of praise, with which to honor our Savior! That moment will be the epitome of worship–total immersion in the awesome presence of holy God. Our hearts will be bursting with ecstatic joy, way beyond any former worship experience, as we reverence Jesus supremely. And cast down our golden crowns for his glory. You remind me of the verse in Luke 17:10 “So you too, when you do all the things which are commanded you, say, ‘We are unworthy slaves; we have done only that which we ought to have done.” (NASB) … Blessings, dear sister and thanks for always pointing us to the Word! Thank you, Heidi. That is a good verse to keep in mind! I honestly don’t spend enough time picturing this. But when I do, my imagination gets fired up and then my soul groans for the day to come. And when I am in that state of joyful anticipation, it spills out onto others. Thank you for the reminder–I shall take some time and ponder this today! Great insight, Rebeca–that living in a state of joyful anticipation will spill out onto others. I see that overflow as cheerfulness, patience, encouragement, and more. Thank you for sharing your vision! Yes, I thought of that hymn, too–one of my favorites! I think we try so hard to get lessons on a level that children can understand and remember that sometimes the meaning gets altered. I remember reading something that told many if the misconceptions we have about the bible because of such childhood lessons. I agree I don’t want to do things with the selfish goal of acquiring more jewels. I want to do it because of his amazing love! Amen, Tresa! Even if the blessings stopped today, He’s already done “immeasurably more than all we ask or imagine” (Ephesians 3:20). Oh, but Cheri, you have so many glowing qualities which your God gave you, and which you are putting to good use: the time, energy, and effort you give to your family, your sweet nature that fills a room like perfume, your gracious and loving ways. Not only does your Heavenly Father love you, he rejoices in you (Zephaniah 3:17)! Thank you so much, Nancy, for the encouraging reply. Take care!